Our family just hit our third year anniversary in this home we live in. Three years ago, my husband and I went through the grueling process of house hunting, and the process was even further complicated by the fact that it was going to be an interstate move for us. Staying put was not an option because of my husband’s new job. We knew we had to face the process head on and there was certainly no room for ambivalence. We were ready, dead serious, and determined for a successful search. The more I got immersed in the house hunting process, the more I realized that it wasn’t any different from finding your mate or getting married. What you know about one can be applied to the other. 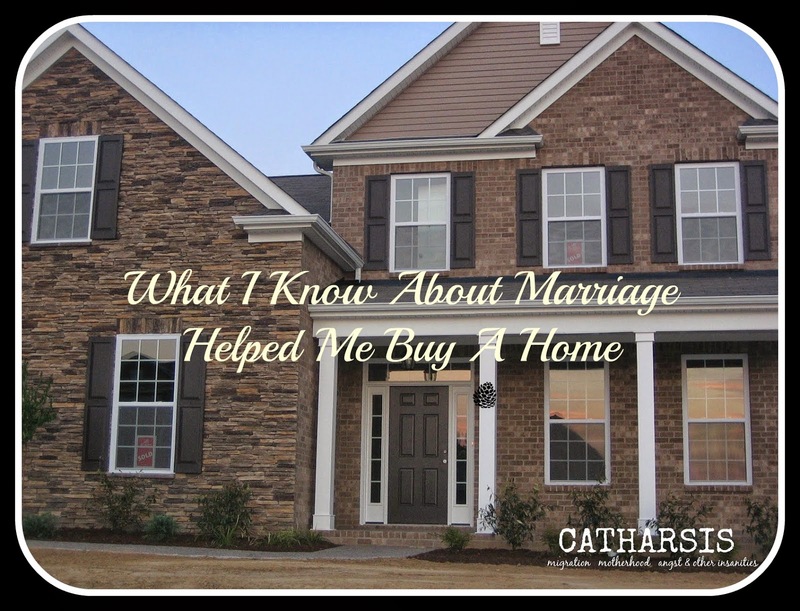 Given everything we went through and lessons I learned as a home buyer, here are my realizations and advice to anyone investing in real estate…or preparing for marriage. 1. You have to spend a LOT of time looking before you find THE ONE. And when you find it, you'll know. You will feel right about it and be very comfortable about taking a leap of faith, in spite of certain fears. It is a commitment after all. 2. The process always has to start with your self and not with what's out there. You have to know (and I mean really know) your finances, your budget, or what you're pre-approved for if you're taking out a mortgage. You cannot begin the search if you don't even know what you can afford. You have to make sure you don't set yourself up for great disappointment by looking at houses that are totally out of your league. In the event that your financial capacity only affords you houses that are unacceptable to you and totally doesn’t match either your taste or your basic requirements, then there's only one thing to do. Wait and save up some more. Work on your finances and get better at it. Otherwise, you just have to be realistic, accept that the pool of choices will always be limited for most of us, and accept what's realistically available out there for YOU. 3. If you're not in love with it, don't 'marry' it. Remember, you'll have to live with it and in it for the rest of your life. Okay, maybe not the rest of your life but a significant number of years. My mother always told me to marry someone whose face I won’t mind seeing first thing in the morning when I open my eyes. It’s the same with a house. You’ll be waking up to it every day and you have to feel good about seeing it and being in it when you do. 4. Once you've made your decision and it's all locked in place, you have to stop looking. There will always be something better out there. There will always be a bigger house, a nicer lawn, bigger closets, more modern kitchens, or better flooring. Remember that the grass will always be greener on the other side. But you have chosen and at least at this time of need, this is the intersection of what you want and what you can afford, so be at peace with your choice and commit to it. You can't have buyer's remorse. It is a house after all, and not a pair of shoes you can return. 6. Your non-negotiables better be the REALLY important stuff and not just a bunch of aesthetics. You can always change certain things such as counter tops, flooring, paint color, cabinetry, etc. However, you cannot change (at least not very easily, or not at all) such things as square footage, location/neighborhood, structural soundness, layout, monthly costs for mortgage payments, and property tax. 7. The house needs to fit YOU, and not the other way around. You can't purchase a home just because you're attracted to some bells and whistles when the bones of the house and its basic characteristics don't really fit you. It’s never wise to commit to something feeling that you need to adapt to it in significant ways, rather than have the house fit YOUR needs, YOUR existing patterns. Yes, some compromise may be required, as I mentioned above, but not to the extent that you are sacrificing yours and your family's fundamental preferences. You can't let the beautiful spa-like bathroom, or the ultra chic kitchen make you forget that the house does not have the minimum square-footage you absolutely need. Or that this one only has 1.5 bathrooms for your family of six, and that this will take you two hours to get to your work place. You may really be attracted to this eye-candy, but if the real substance isn’t there, it really isn’t worth falling in love with and definitely undeserving of your life savings. 8. Timing is everything. You may be ready, but the house you're envisioning is not available in the market. Or the house may be there, but your finances and other circumstances may not allow you to purchase just yet. You need that 'magical' synchronicity, the confluence of all those forces, to make something happen. 9. Unless it's a new construction, each existing house has a past, and I'm a believer in trying to know as much as you possibly can about that past. Everyone has ‘baggage’ and the only question is if it's something you can live with. Has the house experienced flooding before? What is the age of the house and has it ever been remodeled? It's all about making a decision that's as informed as possible, which leads me to #10. 10. There are always risks. The question is, is this one worth it, worth all the risks you're aware of? You will have cold feet. You will question, evaluate and re-evaluate. You will take pause and do everything to delay as much as you can. However, ultimately buying a home is much like any serious commitment you make in your life. You can't possibly foresee everything, can't plan for everything. All you can do is bite the bullet, and be as prepared for contingencies as you possibly can. So you see, committing to a home isn't all that different from finding a partner. You can always have someone set you up, have a matchmaker (i.e. your real estate agent), but ultimately, it will be your decision and the success rests on how much you know your self and what you’re looking for. Self-knowledge is key because frankly, I’ve never heard of a marriage that succeeded and ended blissfully when it was based on too much settling or entered into blindly. Buying a home is a huge commitment that needs to be taken seriously. It takes a lot of hard work and a solid level of maturity before anyone can finally bravely say, "With this key I thee wed". *Author's Note: The list on this post was originally published on Catharsis with the title "With This Key I Thee Wed". Parts of it have been modified for the current publication. Oooooh you're SO right about that, Kathy! Divorce is far messier all around than home-selling! Plus home renovations are easier and far more painless to accomplish than overhauling someone ;-) Thanks so much! Very clever and totally right! I love my house and my husband luckily! This really is a good analogy. We have bought and sold two residences. Now we're renting and we're not sorry to have divorced home ownership which is definitely high maintenance.